The following is an updated version of a news release issued Thursday evening, Aug. 9. This updated release reflects the addition of two bullet items that should have been included in the section regarding the newly approved CWD deer hunting regulations. These now are the first two bullet items in the list below. Additionally, the third bullet item below (regarding the use of lures and attractants) has been updated to reflect the immediate effect of that regulation. We apologize for any inconvenience. Reduced the 4-point on-a-side antler requirement on the restricted tag of the combination license in the 16-county CWD Management Zone. Under the new regulation, a hunter in the CWD Management Zone can use the restricted tag of the combination license to harvest a buck with antlers as long as it has at least one 3-inch antler. Created a discounted antlerless license opportunity in the CWD Management Zone on private land; if purchased, the license will expire Nov. 4, 2018. Effective immediately, a statewide ban on the use of all natural cervid urine-based lures and attractants, except for lures that are approved by the Archery Trade Association. An immediate ban on baiting and feeding in the 16-county area identified as the CWD Management Zone. This area includes Calhoun, Clinton, Eaton, Gratiot, Hillsdale, Ingham, Ionia, Isabella, Jackson, Kent, Mecosta, Montcalm, Muskegon, Newaygo, Ottawa and Shiawassee counties. A ban on baiting and feeding in the Lower Peninsula, effective Jan. 31, 2019, with an exception to this ban for hunters with disabilities who meet specific requirements. The start date on this regulation is intended to allow bait producers and retailers time to adjust to the new rule. 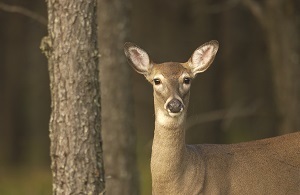 Effective immediately in the CWD Management Zone and four-county bovine tuberculosis area (in Alcona, Alpena, Montmorency and Oscoda counties), hunters with disabilities who meet specific requirements can now use 2 gallons of single-bite bait, such as shelled corn, during the Liberty and Independence hunts. Allowance of all legal firearms to be used in muzzleloader season in the CWD Management Zone. 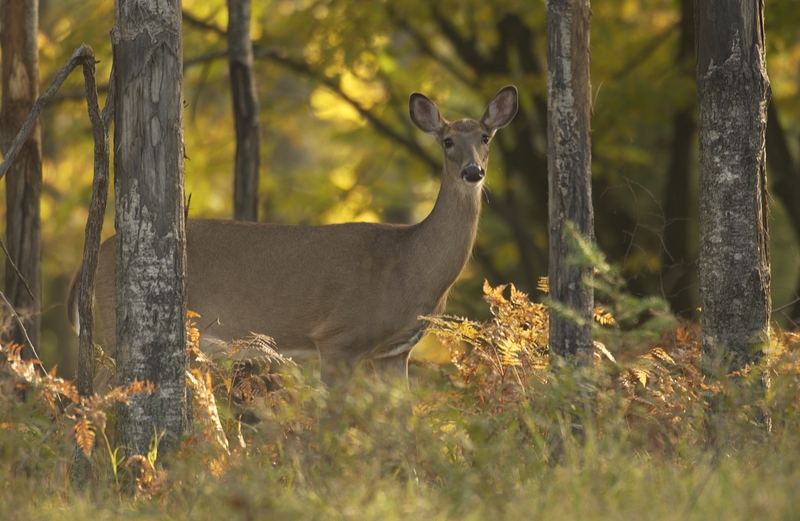 A purchase limit of 10 private-land antlerless licenses per hunter in the CWD Management Zone. Restrictions on deer carcass movement in the five-county CWD Core Area (Ionia, Kent, Mecosta, Montcalm and Newaygo counties) and the CWD Management Zone. Antlerless options on deer licenses/combo licenses during firearms seasons in the five-county CWD Core Area. Expansion of early and late antlerless seasons in select counties. Changes to regulations regarding wildlife rehabilitators. An experimental mandatory antler point restriction regulation in a five-county CWD Core Area, including Ionia, Kent, Mecosta, Montcalm and Newaygo counties. The restriction would begin in 2019, provided a survey of hunters shows support for the requirement and specific department guidelines are met. This is intended as a tool to evaluate the effects of antler point restrictions on the spread and prevalence of CWD, along with deer population reduction. A hunter-submitted proposal for mandatory antler point restrictions in Huron, Tuscola, Sanilac, St. Clair and Lapeer counties. If hunter surveys support this regulation and specific department guidelines are met, it would be implemented in 2019. These regulations come after much collaborative work to better understand the scope and pathways of CWD and best management actions. In October 2017, Michigan hosted a CWD symposium that brought together roughly 200 wildlife scientists and other experts from across the country. Shortly after the symposium, the DNR and the Natural Resources Commission announced the creation of a nine-member Chronic Wasting Disease Working Group. This group was charged with developing recommendations on additional steps and actions to substantially mitigate CWD in Michigan, and in January presented initial recommendations centered around messaging, partnership funding, regional management, and the importance of continuing a solid science-based approach. Throughout April and May of this year, the DNR hosted a series of public engagement meetings in Bay City, Cadillac, Detroit, DeWitt, Gaylord, Houghton, Iron Mountain, Kalamazoo, Marquette, Newberry and Rockford. These meetings provided many opportunities for the DNR to share the latest information and recommendations about CWD, while encouraging the public to offer their best ideas on how to slow the disease. During this outreach period, more than 650 peopled attend public engagement meetings, and the DNR received comments and suggestions via 361 hard-copy surveys and 135 online surveys. Details on all regulations will be added next week to the online hunting digests on the DNR website, and DNR staff will be available at deer-check stations during the hunting seasons, too. More information about these regulations also will be posted next week to the michigan.gov/cwd website. For additional questions, contact the DNR Wildlife Division at 517-284-9453.